Gucci is teaming up with Fiat yet again, this time on the 500C. 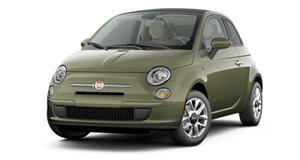 Fiat and Gucci have had recent success collaborating on the 500, and now the pair is back with their take on the 500C. The Gucci Fiat 500C appears very similar both on the interior and exterior to the 500, and with over 3,000 pre-orders lined up for the car, the Italian&apos;s are seemingly going along with the motto &apos;If it ain&apos;t broke, don&apos;t fix it&apos;. The 500C&apos;s interior is fitted with gaudy two-tone Frau leather and satin. The stylish design also includes a velvet-finished radio panel and chrome. It is also equipped with a standard Blue&Me system as well as parking sensors, leather-wrapped steering wheel and CD/MP3 media player. The trendy 500C is available in either white or black. The Gucci Fiat 500C is currently available for order and shipping should start this September. Pricing is set at €20,000.